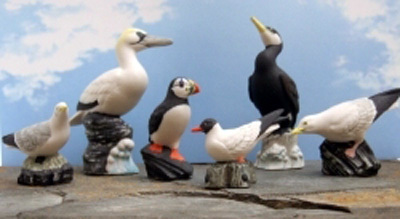 This collection of six well-known Irish Sea birds is realistically modelled in white stoneware with a smooth matt finish. Each bird is hand painted in careful detail before firing, so the colours are permanent. Sizes	are	approximate. Limited availability. Note the code number and price of the birds you would like to buy, and click the "Contact us" button on the left of the page. Type your requirements in the email, send, and I will let you know if your choice is available, and if so, I'll quote for mailing to your destination. To convert currency and measurements to your own preferred units, click here.